Psychobilly stalwarts The Reverend Horton Heat are quite a few years removed from their best work, but they have proven that they still have a lot to offer, particularly in their electric live shows. Now the Rev' has reach back and dusted off and shined up some older material to put together the new record, Rev. Lyrics and a keen sense of humour have always been the strongest part of the Reverend's music, and that's the case again with the standout tracks on Rev. The catchy testament to the irrepressible nature of rock n' roll, "Never Gonna Stop It", includes the killer line 'the Bushes can't stop it/Obama can't stop it'. On "Longest Gonest Man" the band tell the age-old story of a man going out for smokes and never coming back to an awful woman. Falling short is the double entendre -laced "Let Me Teach You How To Eat", a track where the less-than-inspired arrangement fails the lyrics. Many of the songs are standard Reverend Horton Heat fare. Cuts like "Mad, Mad Heart", "Chasing Rainbows", and "Scenery Going By" are all fine, energetic numbers, but they don't do anything special to pull you in. The band even recycle their own riff for "Schizoid". Of course, there are a couple of instrumental songs included in the set. The album opens with the mood-setting "Victory Lap", which leads seamlessly into the female gearhead street racer "Smell of Gasoline". Later, "Zombie Dumb" provides the record's surfiest moment. 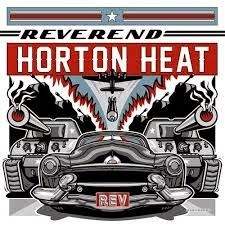 Rev will never find it's place among the upper echelons of The Reverend Horton Heat's catalogue, but still an average record from this act is better than anything most musicians can produce...and existing fans will eat it up. Best tracks: "Never Gonna Stop It", "Longest Gonest Man"